Each week tens of thousands of diners eat at an Olive Garden or Red Lobster restaurant. Few of these diners know that the CEO heading these large restaurant chains is a black man. 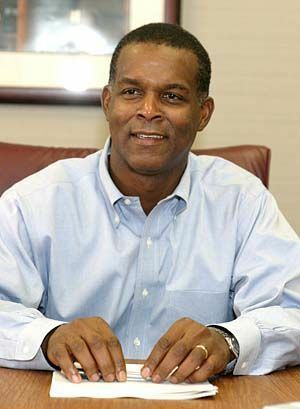 Clarence Otis Jr. Is the CEO of Darden Restaurants Inc., the largest casual dining operator in the nation. The firm operates nearly 1,400 company-owned restaurants coast to coast serving 300 million meals annually. Darden employs 150,000 workers and has annual revenues of $6 billion. Born in Vicksburg, Mississippi, Otis moved to Los Angeles when he was 6 years old. His father was a high school dropout who worked as a janitor. The family lived in Watts at the time of the 1965 riots. In the post-Watts period, Otis recalls being stopped and questioned by police several times a year because of the color of his skin. A high school guidance counselor recommended him for a scholarship at Williams College, the highly selective liberal arts institution in Massachusetts. Otis graduated Phi Beta Kappa from Williams and went on to earn a law degree at Stanford. Otis landed on Wall Street as a merger and acquisitions attorney for J.P. Morgan Securities. He joined Darden Restaurants in 1995 as corporate treasurer. He became CEO in 2004. How many of usï¿½or anyone elseï¿½knew this?! (But we heard all about Michael Vick, didnï¿½t we?) Things have got to change. Start now, by FORWARDING THIS TO EVERYONE YOU KNOW! EARTHQUAKE VICTIMS IN HAITI NEED US! United Way of Miami-Dade, The Miami Herald/El Nuevo Herald, Univision 23 and Univision Radio have activated Operation Helping Hands to help the earthquake victims in Haiti. The earthquake, the worst in the region in more than 200 years, has devastated the country. Profound loss of life and injury is expected. 100% of funds raised through Operation Helping Hands will be used to purchase relief items needed in Haiti during this time of crisis. Monetary donations made to Operation Helping Hands will go directly to help the people of Haiti through non-profit organizations working on the ground. Renewable energy for the rest of us. Click Here! A Long Kept Secret For Generating Free Electricity is Finally On The Open, And You'll Never Have To Pay A Single Dime to the Power Company Click Here!